Below find a list of the methods passed down from Master Yi Eng. While it has been important to keep the integrity of these meditations in terms of their order, components, and goals, there is a degree of flexibility for the adept. This applies moreso to the experienced practitioner practicing solo. Here one cannot only vary the order but can either skip formulas or only partially complete one before moving on to another. The continual theme of this text is to initially learn the formulas as originally taught but then to be flexible with them and allow one’s meditation to be fluid and spontaneous. All the formulas start with the gross or a fragment and take us to the fine and the whole. Each method will ultimately blend in with the others according to your unique personality and history. This technique helps to open the crown by vibrating the bones at the sutures with micropressure and to project the pearl/soul/spirit. It has been found that when one holds the breath, the skull vibrates, thus loosening the bones, making it possible to open the crown for the egress of the spirit. Basically, the procedure assists in activating the Cranial and Sacral Pumps. This principle is similar to Greater Kan and Li, when we connect beyond self by spiraling through the crown and the feet (perineum) and setting up vertical and earthly flight. However this time we extend beyond the earth and the imagined solar system to connect to the Pole Stars, both the North Star, Polaris, above the Crown for those in the Northern Hemisphere and Polaris Australis for Southern Hemisphere practitioners. 1. Form another pearl and settle it in the perineum. 2. Move the pearl in the Microcosmic Orbit and let it gather momentum. 3. Slow it down and let it rest in the crown. 4. Activate the cranial pump (look up, clench the teeth and jaw, sink chin and sternum, clench the fists, tighten the buttocks, and pull up the sexual organ). 5. Exhale and shoot the pearl through the crown, extending the pearl many body lengths above you. 6. Swallow saliva upward as you feel the earth force come up to you. 7. Exhale and completely relax any muscles you have tensed. You must be able to totally release all body tension so that the chi can flow easily through the pumps and throughout the body. Work toward activating these pumps through structural alignment and mental focus only. 8. Draw the yang energy from the Pole Star into the Crystal Room and other tan tiens. Merge this experience with that of the third eye. 1. Shoot the pearl down the legs, many body lengths into the ground and then beyond the earth to the Pole Star beneath. Connect with its more yin nature. 2. Create a pakua around the pearl. 3. Extend the thrusting routes and belt routes to the bodies in and beneath the earth. 4. Gather in the middle of the toes and the tan tiens and gather to the mid-eyebrow. One may then merge the third eye with the earth plane experience. The second goal is to assist in alignment of the body whereby all the forces are in unison and working together. This can be seen from a perspective of the earth force in alignment with the heavenly force and the body’s internal energies. 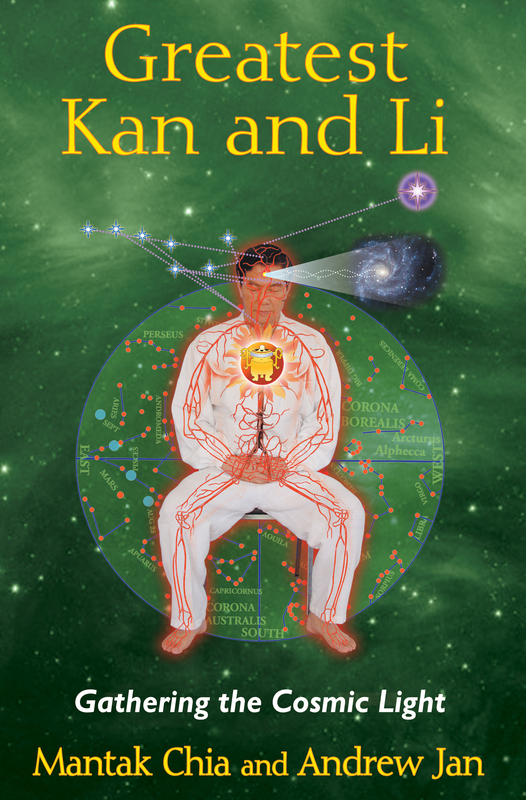 An alternative framework is that the resident spirits within the body are in harmony. The spirit that exists above the crown (Highest Soul) along with the Dragon spirit can work to reach the Pole Star above. The Earth Soul beneath the feet along with the Tiger spirit extends consciousness to the opposite Pole Star. The spirits in the head, heart, abdomen, and behind the knees all serve to align the body with these vertical forces. The third goal is to receive pure energies from the Pole Star. As early as the Han era they believed the Pole Star encompassed the “unitive” experience. Ge Hong says, “The One resides at the North Pole . . .Dragons and Tigers are lined up on guard.” In the Universal Healing Tao the Pole Star not only is the “gateway” to an experience of the “one” but also emits a violet healing light that has a remarkable healing effect and a specific resonance with the bones of the body. The Pole Star beneath is usually felt as more yin.